I’m not the biggest romantic drama person (or romantic comedy person, for that matter). It takes something special for me to get to like one, and to be honest, I was not planning on liking writer/director Sam Esmail’s Comet as much as I did. 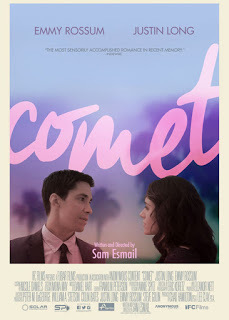 Condensed version: it chronicles the relationship of Dell (Justin Long) and Kimberly (Emmy Rossum) over the course of six years in a parallel universe. We get to see, out of order, how their relationship evolves. It’s tricky at first to figure out what’s going on where, and in piecing it together, figuring out what it means. Once you get a grip on it, though, it becomes a beautiful statement about love under multiple interpretations. Honestly, I loved this film. … but then, we take into account Dell’s speech at the end of the film, which completely changes how I view the meaning and the ending. Dell brings up that he almost proposed to her in the Parisian hotel room, noting, “I don’t belong in a world where we don’t end up together.” He explicitly states that this world feels like a dream and that he thinks that there are alternate universes where they wind up together. Something inside of Dell knows that this is wrong, and maybe I’m just a sap, but I think he’s onto something because I don’t want to believe that this guy is completely out of the game. I want Justin Long to win. Always. Meteor shower: Dell needed to win Kimberly over, and lied about multiple things (including seeing The Sixth Sense). Hotel room: Dell wanted to propose to his unhappy partner, but hid the ring and his intentions from her. Train: Dell needed to win her back, and did so under the admittedly false pretense of going to meet someone else in order to get her to talk to him. 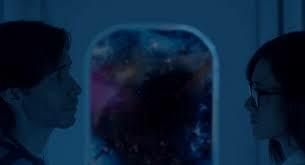 Long-distance phone call: Dell tells Kimberly he doesn’t love her in order to spare himself the pain of her emotional affair and the inevitable death of their relationship. Frame: Dell immediately launches into reasons why he can’t be with Kimberly in order to justify why they don’t make sense together. Each time, Dell had the chance to own the truth, and there is where I think the splinters of the timeline originate. Each one reflects a collecting point in that particular universe where the alternate decision landed. In theory, here are five other universes where things could have gone differently according to the permutations: maybe he was able to be more honest on their first date; maybe he chose to propose in Paris; maybe he fought for her and didn’t need to get her back from Jack, making the train ride obsolete; maybe he and Kimberly were able to work on things long-distance so that they could go the distance. In this respect, each major segment reflects a “what if” in a negative aspect for him. The Dell in this universe can’t win here because he’s already won somewhere else (and, quite possibly, multiple times). In the end, though, Dell chooses to fight for her, despite that she is engaged and expecting. He knows that they need to end up together. We get the minute of silence, then we see him rush to her. The implication is that he will kiss her, but really, it’s up to us to wonder: is this the splintering of another universe where he failed, or will Dell actually get the girl this time around?